Colored Easter eggs are beautiful, but why stop there? 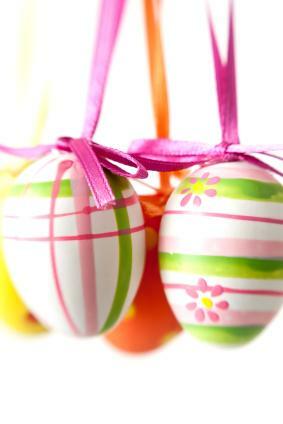 This year, make amazing Easter egg crafts you'll want to keep and reuse for years to come. This project will make you think about decorating eggs in an entirely new way. Since there is some drying time involved, you can work on more than one egg at a time if you like. Pour a 50 cent-sized pool of glue onto a paper plate. Starting at one end, apply a coating of tacky glue to approximately 1/3 of the egg using the sponge brush. Select the color of yarn you want to use as the main covering for your egg. 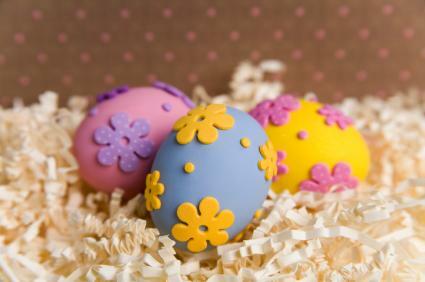 You'll get the best results if you choose a color that matches the egg's own color. Press the end of the yarn into the glue directly on the center of the end of the egg. Slowly and carefully, begin wrapping the yarn around the spot where you began in a circular pattern. Make sure the yarn sits in a single layer with no spaces between the strands. When you completely cover the first glue-covered area, stop and give the glue about 30 minutes to dry. This will allow you to grip the yarn-covered end without ruining your work as you proceed with the next step. 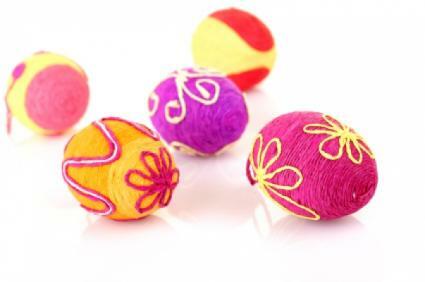 Apply glue to the middle third of the egg, and continue wrapping the yarn around to cover the glue. Give that section time to dry before you proceed. Apply glue to the final third, and finish covering the egg. Snip off the end of the yarn as close to the egg as possible, and make sure the tip is securely pressed to the glue. Let the egg dry. Before you begin the next stage, decide which kind of designs you'd like to layer over your base cover of yarn. You can use the photo above for inspiration, but you can also try doodling designs on a piece of scrap paper before you add them onto your egg. Make sure the tip on the glue is open and that the glue flows freely. You are basically going to draw a simple design with the glue, and then carefully apply a different color of yarn over it following the design. It's almost the same principle as applying glitter to glue, but you're working with yarn instead. Let each separate design dry before you add another one, or you risk pulling the yarn away from the wet glue. Making these cute little bunnies is almost addictive. Once you've made the first one, you'll want to provide him with some friends. Using the sponge brush, paint the wooden egg white and let it dry. Add a second coat and let that dry. Using the photo as a guide, paint stripes of different colors around the wider bottom portion of the egg. Let it dry. 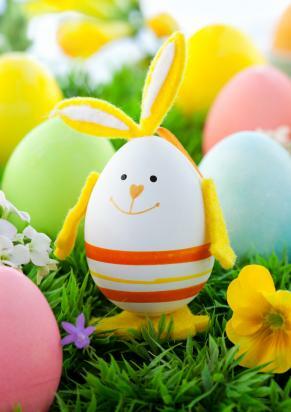 Paint the bunny's facial features on the upper portion of the egg. Draw the outline of the bunny's two feet on the craft foam. Make them meet at the heels and cut out the entire piece as one unit to make them easier to glue to his base. Draw the bunny's arms on the craft foam and cut them out. Draw the bunny's ears, but make them meet at the base so they'll be easier to glue to his head. Cut these out. Paint the inside of the ears a different color than their base color. Place a dollop of hot glue to the center of the bunny's base, and set it on top of his feet. Hold the egg until the glue is completely hardened. Squeeze a dot of hot glue on one arm and attach it to the egg. Let it harden, and then repeat with the other arm. Place a dollop of hot glue on top of the bunny's head, and quickly place the base of the ears in it, holding them until the glue hardens. Place a dot of hot glue where you want to put the tail, and apply the pom pom, holding it until the glue hardens. Hang these beautiful ornaments from a tree in your front yard. To blow eggs, poke a small hole in both ends of the egg with a needle. Push the needle into the egg far enough to break the yolk. Blow into one end of the egg so the liquid comes out the other end. Place a bowl underneath to catch the whites and yolk as you blow. Run cold water inside the egg and shake slightly to make sure all of the egg particles have been removed. Carefully place the egg on a towel to dry for 24 hours. Paint the eggs any base color you like, and let them dry. Paint any designs you want on the eggs. Suggestions include stripes, flowers, polka dots, etc. Once all the paint is dry, spray the eggs with two coats of sealer, allowing time to dry between coats. Cut an 18-inch piece of ribbon for each egg. Tie the ends of each ribbon together in a bow. Securely hot glue the bows to the tops of each egg, leaving the the loops free to use for hanging. You can really make this project your own by choosing the florals and egg colors you like best. Just use the photo as a basic guide for how to pull it all together. A silk flower and ivy garland, long enough to wind around the wreath. Starting at the top of the wreath, secure one end of the garland with floral wire. Wrap the garland around the wreath, but do it loosely enough that some of the grapevine still shows. When you work your way back to the top of the wreath, snip off the excess garland and secure that end to the wreath with wire. Starting back at the top, begin hot gluing the eggs directly to the grapevine in the open areas. Try to keep the entire design balanced and evenly spaced. Make a hanger from the wire by looping it through the back at the top of the wreath and twisting the ends securely together. This project is a great Easter craft to do with kids. Dye your eggs and make sure they are completely dry. Apply the foamy stickers to the eggs in a pleasing design like the example above. Arrange the eggs in the basket for display. Spending time with family and friends is one of the most important aspects of this holiday time. 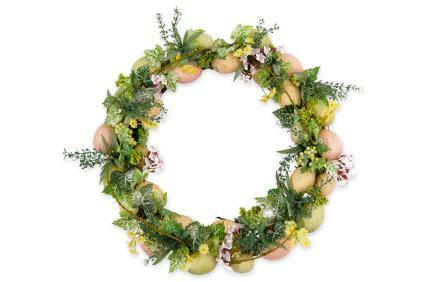 Create Easter memories as well as beautiful decor items for your home by inviting others to make them with you.